Most of the ingredients are from my dried herbs/flowers from last year, with some kitchen ingredients thrown in. All are chosen to welcome positive love, with passion, energy and a little grounding. I also used some tiny slivers of Rose Quartz. 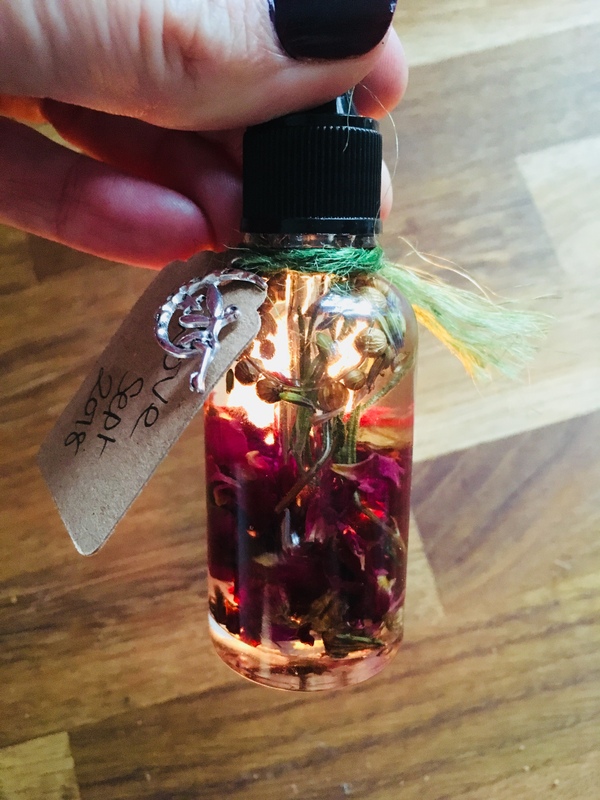 This oil can be used for anointing wrists, ankles and behind the knees, especially lovely after a bath, or you can use it to rub into crystals, stones or anything you want to infuse with love. You can even place drops around your bedroom, living room and garden to welcome a more positive love energy into the space. I always use fractionated Coconut Oil with spell oils, as it is clear, will not harm people with nut allergies and washes out easily and does not stain, absolute practical magic! You may notice that I used a little sprig of Rosemary in my oil – I put Rosemary in nearly everything, because I am in love with it in many ways, Rosemary makes me happy. Place the dry ingredients into the bottle first, then fill with the oil. Leave to ‘brew’ for a minimum of 24 hours. Use happily within 6 months, and oh isn’t it pretty!